Problem: A traveler comes to a fork in the road. One path leads to the land of L, where people always lie, the other path to the land of T, where people always tell the truth. At the fork is a man, but the traveler does not know if the man is from L or T. We can ask him only one question. What question should the traveler ask to ensure he gets to T? Solution: Let's draw a picture, as this often helps find the solution. 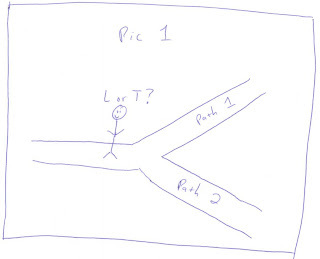 Pic 1 shows the problem, where we have encountered a man from L or T and we are trying to find the correct path to T.
If the man is from L, he will always lie. If he is from T, he will always tell the truth. We have to determine a question, which will allow us to know which way to go, irrespective of whether he is from L or T.
3. The answer must not depend on whether the person is from L or T. It must be definitive irrespective of the person's home. 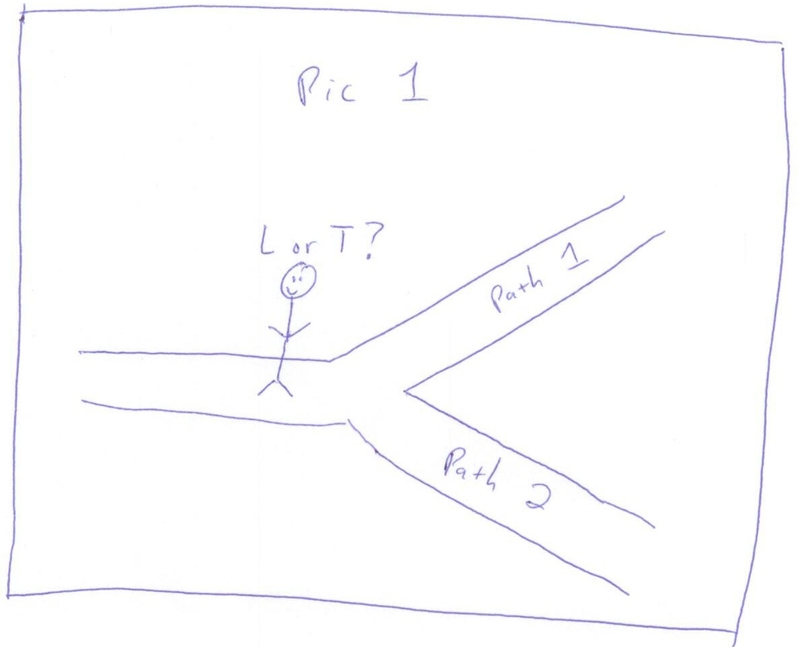 --Are you from L or T?-- They both say T in this answer, and we don't know where to go? Let's think about a two question combination that could work. This is in fact trivial. Which path goes to T? Unfortunately, we don't have two questions (and we can't put both in one question). One thought here is to try to ask a question that reveals both the person and answers something about the path, like: What path is the best path? But again, this doesn't work either. At this point, let's look at the two question combination? Is there anything that we don't need in there? Well, one thing is that we actually figured out too much -- we don't actually need to know what city the man is from. So, with this insight, we simply need to know the right path, and we have essentially a true and a false. We can use these to cancel each other out. For example, we can ask the man, "What path would the other person say goes to T?" Hence, each will give the path to F." Then, we can take the opposite. There is nothing terribly tricky about this problem. The important thing is to be structured, not just start guessing and to try to glean insights of what is needed and not needed. Some people find truth tables helpful in this problem, but I never have. Also, there are other questions, but they typically involve negating either with someone from 'your town' or 'the other town', e.g., "What path leads to your town (negating with yourself)?"